Welcome TO JAMES HOWE’S WEBSITE! If you were looking for James Howe, author of over 90 books for young readers, including Bunnicula and The Misfits, you’ve come to the right place! If you were looking for a different James Howe, may I invite you to stick around just a little longer? I’m sure he won’t mind – whoever that other James Howe is – if you spend a little time getting acquainted with this one. As for those over 90 books I’ve written, they’re all there under BOOKS. You can even buy one in my STORE if you’re looking for something to read. HOWEVER, as easy as it is to shop online and as much as I do it myself, I want to encourage you to support your local bookstore (if you’re lucky enough to have one) and buy your books there as often as you can. And don’t forget your local library! If you’re concerned about bullying and name-calling, you’ll definitely want to check out No Name-Calling Week and The Misfits in the TEACHERS & PARENTS section. And if you’d like to hear me sing (aw, come on), be sure to visit the MUSIC page. I’m still writing books, but I’m also writings songs these days. The MUSIC page is all about that. I hope you’ll enjoy the time you spend here and will come back in the future for new information and updates. You can even tell all those other James Howes to drop by. Thanks for supporting books and the people who write them! Houndsley and Catina are back! Read about best friends Houndsley and Catina as they experience summer, fall, winter, and spring in this collection of the first four books in the series, Houndsley and Catina Through the Seasons. 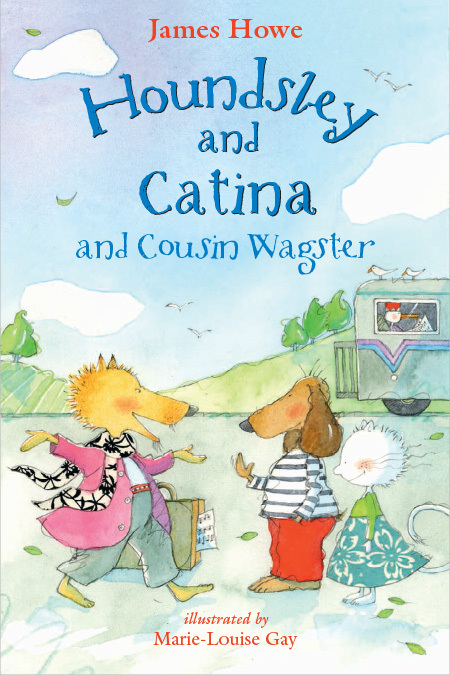 And meet Houndsley's adventurous cousin Wagster in the fifth book in the series, Houndsley and Catina and Cousin Wagner! BUNNICULA is now a cartoon series on Boomerang and Boomerang.com! I love it! It’s funny, it’s silly, it’s just a little scary, and it’s completely off-the-wall! To learn more about the series, visit the Bunnicula page. My latest picture book, Big Bob, Little Bob is the story of two boys – both named Bob – who live next door to each other. The question is: Can two very different boys who have very different ways of playing be friends? The other question is: Which Bob do you think was based on the author? Music is a really important part of my life. I’ve sung since I was a kid (in school choruses, in musicals, in the shower, at the piano) and I’ve been singing with my husband Mark as part of a singer-songwriter duo called Old Dogs New Tricks for the past several years. You can read more about that in the Music section of this website. And you can read about it in Behind the Song, an absolutely terrific anthology of music-related stories and personal essays, written by 14 young adult authors and musicians. I’m excited to be one of them, and especially to be writing as an author and a musician. My piece, “How Miracles Begin,” tells the story behind the writing of Mark’s and my song “Planting Trees.” I chose that song because every time we sing it I feel in my body just how much it means to me and how important it is to share its words with others. To learn more about Behind the Song, visit the book's website. To hear “Planting Trees” and read more about it, visit the Music page. OutCasting, public radio's groundbreaking LGBTQ youth program, is produced monthly by Media for the Public Good.On this edition of OutCasting, I am asked what it was like to grow up as gay in the 1950s and 1960s, why I felt I couldn't come out until later in life, and the support systems that eventually made that possible. In this very personal interview, I also talk with OutCaster Jamie about my strong desire to be a dad and the effects my coming out had on my daughter and my marriage. To listen, please visit the Media for the Public Good website. Celebrate Nearly 4 Decades in the Life of a Bit of Whimsy that Became a Modern Children's Book Classic! Bunnicula Author James Howe in Conversation with fellow author Roni Schotter with Live Music, Cartoon Mayhem, and More! This promises to be a totally fun event, with lots of surprises as I talk about the origins of Bunnicula and all that's happened to it since its publication in 1979. Presented by the Youth Services Section of the New York Library Association, the Empire State Award honors an author or illustrator living in New York State whose body of work represents excellence in children’s or young adult literature and that has made a significant contribution to literature for young people. The 2017 Winner was James Howe. Mr. Howe spoke at the Empire State Award Luncheon at the NYLA Fall Conference on Friday, November 10, 2017 in Saratoga Springs, NY.